Our Save Sefton Park Meadows posters are back up on the site! And just in time, as the Meadows will be marketed from Monday 2nd December 2013 to potential developers. After an angry exchange with Chief Executive Ged Fitzgerald, who instructed his council’s grounds maintenance firm Amey to remove our campaign banners a few weeks ago, we welcomed the Liverpool Echo to photograph us putting them back up. Ged Fitzgerald said he had received public complaints and that the campaign was in danger of committing ‘ common law trespass’ by putting advertising up without permission on council assets. Campaigner Janet Pell immediately write to the CEO to ask for clarification and lodge a formal protest that this was preventing lawful democratic opposition to one of the most controversial proposals from the Council. Using posters on the Meadows was one of the few available visible campaign activities that local people have to show opposition and gather public support. 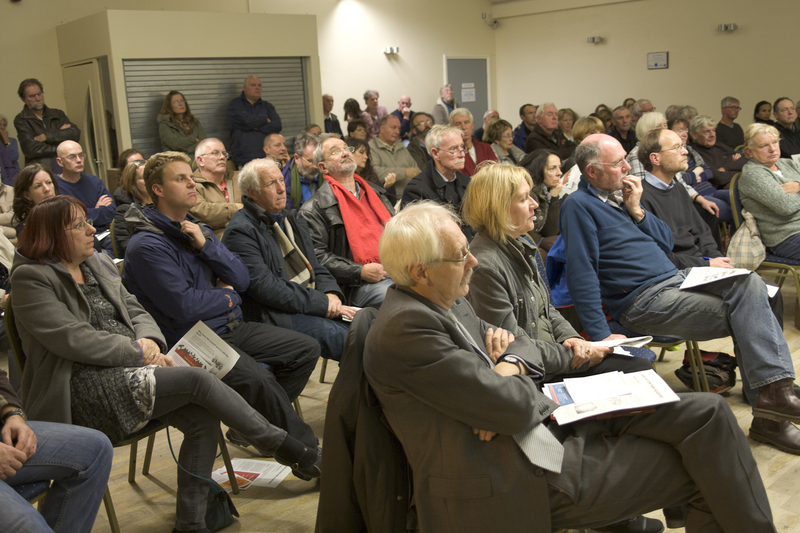 The recent Public Meeting confirmed Janet’s opposition. Cllr Richard Kemp of the Lib Dems then contacted the CEO to request details of the complaints and to see details of the council logs. To date, this has not been forthcoming. Cllr Kemp and Green Party councillors John Coyne and Sarah Jennings have given their support and Cllr Kemp invited the Echo to join us to put posters back up on Friday 29th Nov. We expect this to be published in the Echo on Sat 30th Nov or Mon 2nd Dec. Despite our requests, the campaign to save the Meadows has not been formally notified of the Marketing date or details. We are pressing for these and will make them available on the website and Facebook page. Categories: Planning Process | Tags: Amey plc, campaign, council, Councillor, disposal, health parks, housing development Liverpool, Joe Anderson, Liverpool City Council, Loss of openspace, Meadow, meadows, Park Avenue, Sefton Park, Sefton Park Meadows, Sefton Park Meadows campaign, sell off Liverpool | Permalink. They believe in their past, know their history will last, It’s something which won’t get away. The word which describes it – OBSCENE. Categories: IDEAS, Planning Process | Tags: campaign, council, disposal, green, health parks, housing development Liverpool, Jim Baxter, Joe Anderson, Liverpool City Council, Sefton Park | Permalink. 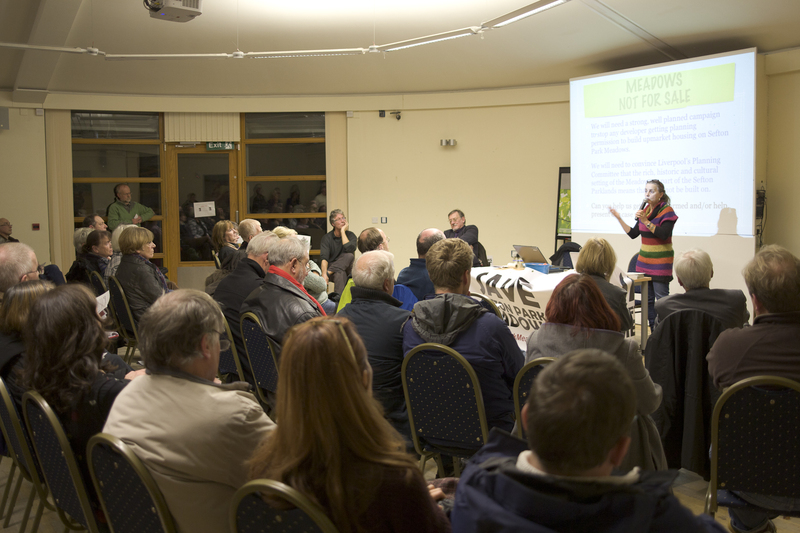 A packed Public Meeting called again for Liverpool City Council to rethink its decision to advertise Sefton Park Meadows to developers as a potential site for luxury housing. Over 120 local people came to show their anger and frustration that the Council has overruled 1,300 written objections and an e-petition of over 7,200 people. It has become clear the the decision to sell has come from Mayor Joe Anderson and the Public Meeting are calling on him and the Council to draw back from selling one of the most valuable conservation area and heritage greenspaces in the city. 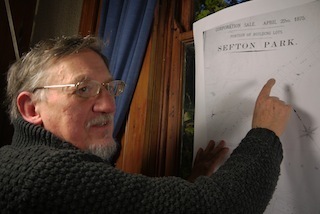 Local people were brought up to date with new historical research by ex-univerity lecturer John Middleton showing Edouard Andre’s final design for Sefton Park did not include villa development on the Meadows, and that the City Council specifically refused to accept bids for housing on this site at the time. John also revealed research work on the original tree plantation design around the Meadows, which closely mirrors the design for trees across Sefton Park by Andre as detailed in his landscape handbook ‘L’Art des Jardins’. 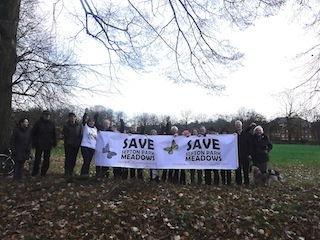 Local people at the meeting were clear in their views that the Meadows IS part of Sefton Park, has historic, aesthetic, ecological and cultural value and should be withdrawn from sale. Many ideas came out of the meeting to press the Council to back down. The campaign group will take as many of these forward as they can AND asked local people to do their bit to keep up the pressure on the council. Check our Facebook page for reaction to the Public Meeting and have your say! Categories: Uncategorized | Tags: John Middleton, Liverpool City Council, Public Meeting, Sefton Park, Sefton Park Meadows | Permalink. 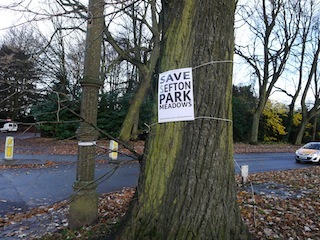 Sefton Park Meadows campaigners will be revealing original Park landscape maps showing the Victorian designer’s final intention to keep the Meadows as open space. Come and find out more, as well as an update on the campaign’s renewed battle with Liverpool City Council to oppose any planning application for housing development. 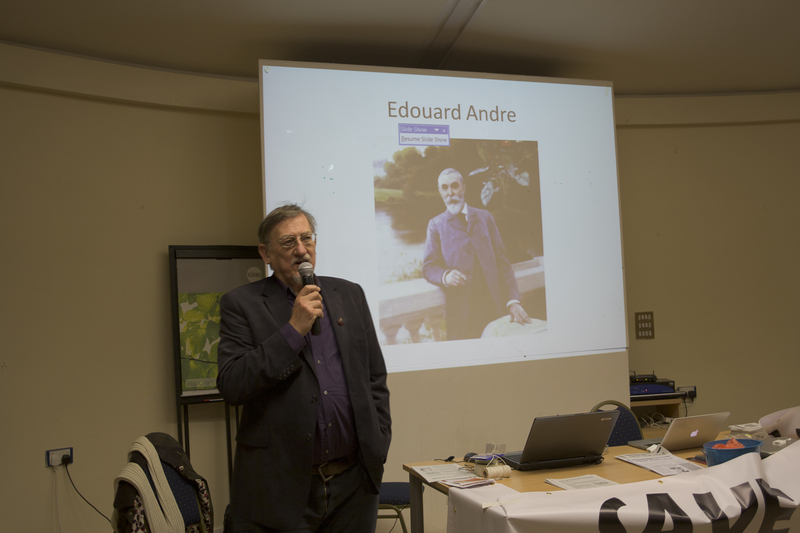 Retired university lecturer John Middleton will be showing the results of his research into council documents which demonstrate that Edouard Andre intended to keep Sefton Park Meadows as Green Open Space. – A map dated 1875 by Edourd Andre showing the final Sefton Park design, the plots of land for sale and the plots already sold. The Meadows are shown clearly to have no plots for sale. – That offers to buy the meadows between 1879 and 1890 were rebuffed by the Parks and Improvements Committee of the City Council because they always wanted to keep it as open grassland. The Map and copies of the original council meeting minutes will be available at the public meeting. Mayor Anderson has argued that there was always an intention to build on the Meadows, and publicised an earlier Andre map drawn in 1867 for the Sefton Park competition to win the contract . It was revised to the later, finalised maps, which were used to actually construct Sefton Park. John is also researching the case that the Meadows themselves were actually part of the Park design by the world renowned Parisian landscaper Edouard Andre. John will show how the way its trees were planted is exactly the design style recommended in Andre’s own handbook “L’Art des Jardins”. This information has been passed to English Heritage and they are currently assessing it along with our application to extend the Grade 1 listing to the Meadows. We are clear that the Meadows has the same international heritage value and is part of Sefton Park. Categories: Uncategorized | Tags: Edouard Andre, John Middleton, Liverpool City Council, Sefton Park, Sefton Park Meadows campaigners | Permalink.